My friend and partner Mike Gregory and I linked up with a former student of mine Ryan Collister today in the hopes of finding a copperhead in its natural habtat. Our plan was to explore some of the upland areas along the rail road tracks in search for some fence lizards. 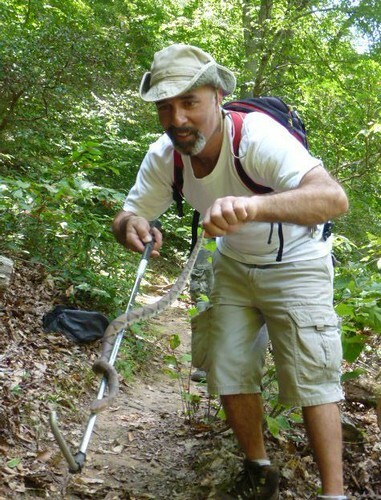 Mike was conducting an educational program on Virginia’s native lizards and therefore was in need of a live specimen. I knew of a good place and we proceeded to that area. Within a 20 minutes we had located and captured a small fence. The naimla was subsequently released back where it was found unharmed after the program. Once we had our lizard we then headed to a near bu stream valley looking for whatever other herps we could find. It was Ryan’s birthday however and he had his hopes set on finding a copperhead. I took Ryan and Mike to some well known copperhead territory. Mike and I had discovered one during spring break in area not too far from where we were heading. The search did not yield any copperheads but produced severla other species of herps. In all we found 3 differnt species of lizards, two species of turtles, one toad, two species of frogs, three species of salamanders, four species of snakes last of which and featured here in a series of video the coveted copperhead which Ryan found. Ryan (below) holds his first wild caught copperhead at the end of his hook.